At the Bed Butler Company we are proud of our mattresses which have been designed and built with all the knowledge and experience of our master bed makers. 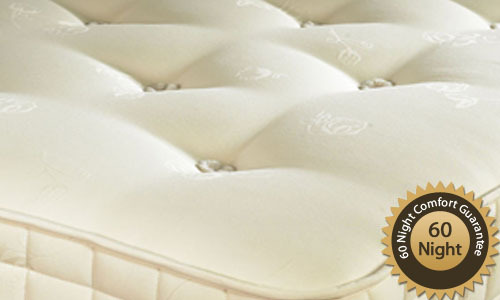 They have used the latest sleep technology which has ensured that they have achieved the ultimate support and comfort expected of a mattress. The Bed Butler – Classic Mattress uses pocket springs covered with the finest natural fibres to ensure that you will have the correct support and comfort for many years to come. The Bed Butler Classic Mattress has 1000 springs, each one individually set in its own cotton pocket, tied together so that they always remain linked together. This allows the springs to move completely independently giving every part of the body its own unique support. The springs are very closely packed together avoiding any sideways movement which could cause a dip in the mattress. 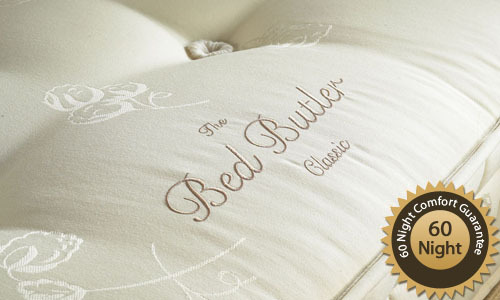 The Bed Butler Classic Mattress is upholstered using the finest cotton fabric. The filling is made using 1250 gm. Dual Density Fibre to give the ideal support and comfort needed for a good night’s sleep. 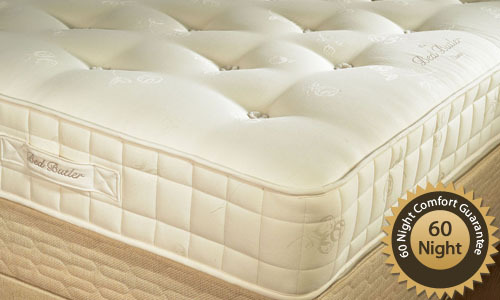 The natural fillings used in the mattress together with the independent pocket springs, helps to reduce the settlement of the mattress and therefore allows it to be turned much less. The Classic Mattress is nine inches (22.5cms) deep with two rows of hand stitching to secure the pocket springs ensuring the edge gives the same support as the rest of the mattress. The pocket springs are held in place by pom-pom tufts situated along the surface of the mattress. These are very soft creating a soft smooth and comfortable surface. There are suitcase style handles situated around the edge to aid with turning the mattress. Air vents are also set into the sides to allow air to circulate freely. 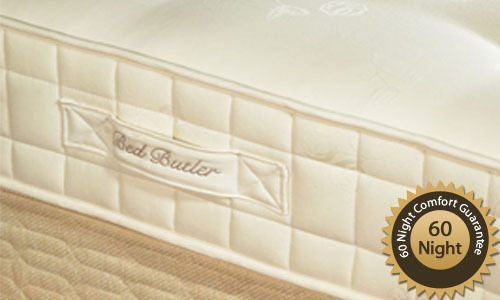 At The Bed Butler, we understand what a big decision buying a new Bed or Mattress can be. We're so confident that The Bed Butler Mattress will give you the best night's sleep of your life, that we're willing to let you try them, in your own home for a full 60-nights. We ask that you trial the Bed Butler Mattresses for the full 60 nights. This will allow time for a true evaluation of the benefits. There can sometimes be an adjustment period when you begin to sleep on the mattress. Some people have experienced a feeling of stiffness after the first couple of nights. This is normal as the mattress is realigning your body to its natural sleeping position. That is why we recommend that you try your Bed Butler Mattresses for the full 60 nights.